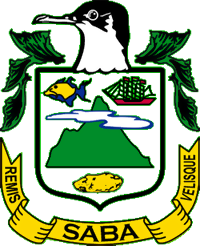 Coat of Arms: Saba's coat of arms is comprised of a shield containing a fish, sailboat and potato which represent the fisheries, Saban seaman and Saban potato. The volcanic island of Saba is depicted in the middle. The bird head resting on top of the shield is an Audubon's Shearwater, which is the national bird of the island. Below the shield, the island's motto, "Remis Velesque" ("With Oars and Sails") is displayed on a ribbon. Motto: "Remis Velesque" "With Oars and Sails"